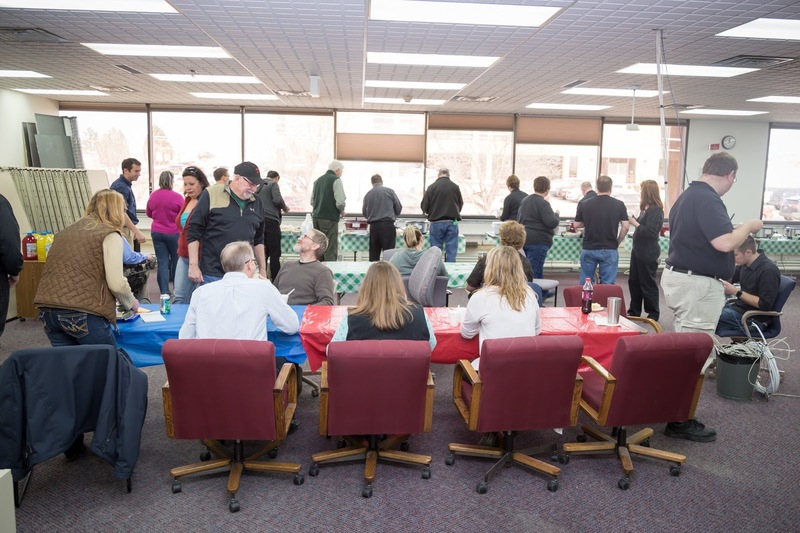 BIT held its second annual Soup-Off on Thursday, February 2nd. Many delicious soups, full bellies, and contestants later, three contestants were able to climb their way to the top. 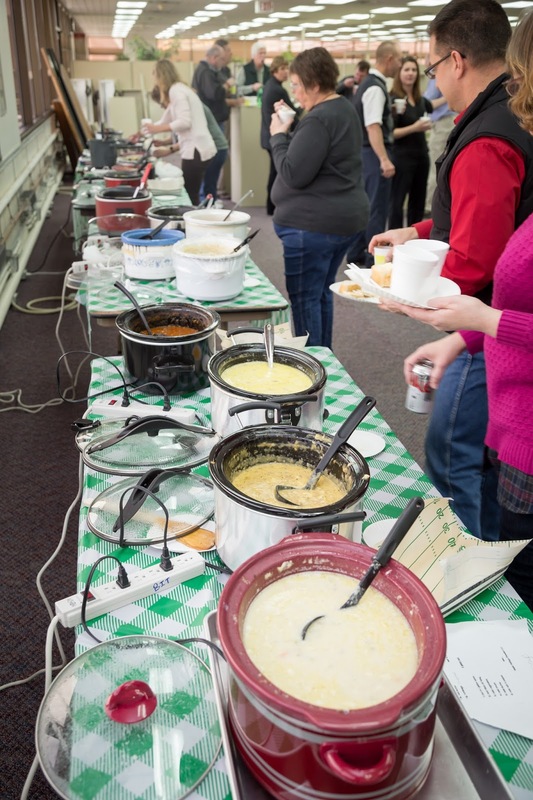 Rochelle Hyde took 1st place with her Cheesy Chicken Tortilla Soup, Wayne Wayt stole second place with his Hot Chili recipe, and Betty Hanson scored third with her Bacon Cheeseburger soup! Luckily for us, the three top chefs were gracious enough to share their award winning recipes! In large saucepan (or pot), sauté onion in butter for 2 minutes. Stir in flour until blended. Gradually stir in the broth. Bring to a boil. Cook and stir for two minutes longer, or until thickened slightly. Add Velveeta, shredded cheese and salsa. Cook on medium-low until cheese is melted. Stir in half and half. Add the chicken back in. Stir. Heat through but do not boil. Remove from heat. Garnish with Fritos (you can also use guacamole, sour cream, and green onions). Enjoy! Prepare the onion, bell peppers, and tomatoes and have them ready to add to the pot. Open all cans and have them ready to add to the pot. Mix the raw Italian pork sausage and hamburger together. Brown sausage and hamburger, mix in frying pan, and then drain. Place the diced tomatoes in a 4 quart pot and then add the browned sausage and hamburger mix. Add beans, tomato sauce, diced green chili peppers, and chopped jalapeno peppers and stir (do not rinse or dispose of cans at this time). Add the chopped bell peppers and onion. Stir. Fill one tomato sauce can approximately 1/3 full with hot water. Stir then transfer to other tomato sauce can, stir, and then transfer to bean cans repeating process. Add this water to chili and stir. (Heat with burner set to medium heat- based on stove this may vary). Add chili powder and cumin. Stir. Stir often while heating. When steam appears (do not boil), cover the pot and turn heat to simmer for at least 1½ hours (stir occasionally – approximately every 10-15 minutes at first checking heat then approximately every half hour). Allowing the chili to simmer for 2 ½ to 3 hours enriches the flavor. Note: if chili bubbles rapidly while simmering, turn down the heat and stir. A very mild, slow bubbling is preferred. Melt 1 tablespoon butter over medium heat. Cook onions and hamburger until hamburger is brown. Stir in basil, parsley, bacon bits, broth and potatoes. Bring to a boil and simmer until potatoes are tender. Melt butter and stir in flour. Combine with milk. Gradually add milk and butter mixture to the soup stirring constantly. Add cheese to soup and continue stirring until cheese is melted. Stir in sour cream. It’s ready to eat! Every year my husband’s side of the family have their annual Christmas Soup Supper. 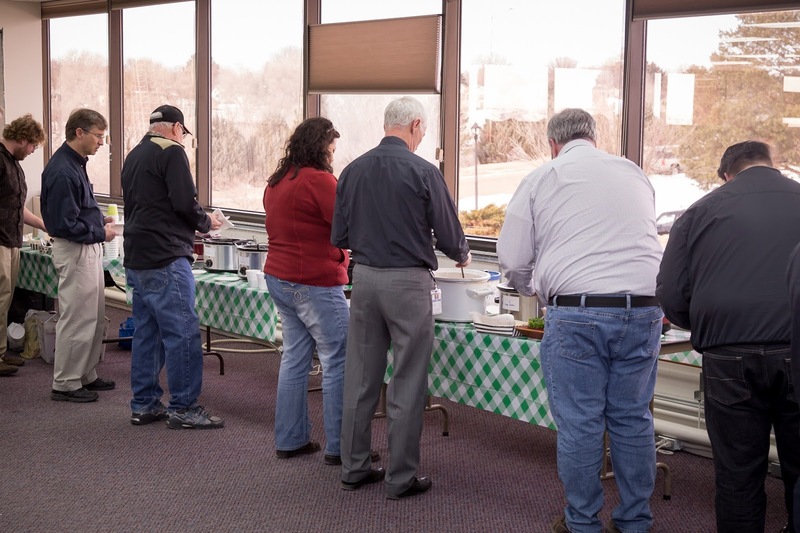 Everyone brings a soup to share. I wanted to try a new soup other than the ones I’ve brought in the past. One day while pinning I ran across this recipe. Sounded delicious and decided that’s what I was bringing to the Garrigan/Hyde Soup Supper. It was hit, first soup gone usually indicates it was a winner and everyone said it was absolutely delicious. When the BIT Soup off was announced it was a no brainer, I thought let’s give this another shot and see if my “BIT Family” likes it as well. Congratulations you three! Looking forward to next year’s competition! 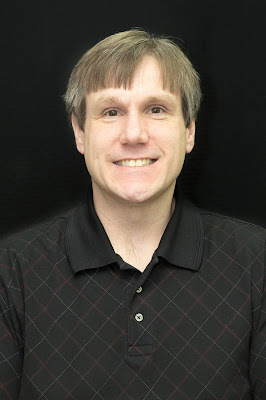 Please Welcome New Employee, Bernie Cruser! Bernie has recently joined the BIT family as a Computer Support Specialist. Originally from Granite Falls, Minnesota, Bernie attended college at Lake Area Tech in Watertown, South Dakota where he majored in Electronic Systems Technology. Welcome to BIT, Bernie! We are excited to have you! 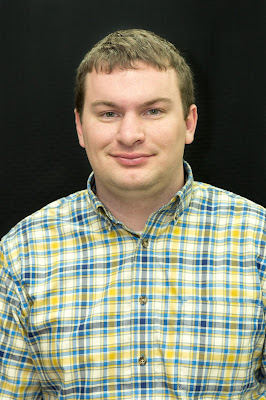 Please Welcome New Employee Evan Wempe! Evan Wempe has recently joined the BIT family as a LAN Services Technician. Evan is a native to Pierre and attended SDSU where he studied computer science. Prior to working at BIT, he was a car salesman at Gateway Ford in Pierre. Evan is most looking forward to gaining further knowledge about the LAN Services industry while working at BIT. In his free time he enjoys working on vehicles and drag racing in the summer. He also likes building computers in his free time. Welcome to BIT, Evan! We are happy to have you!